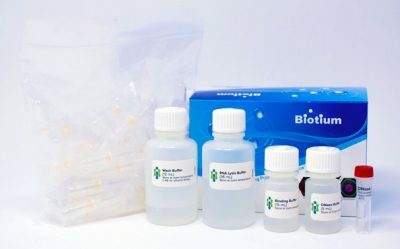 Total RNA was extracted from 107 Jurkat cells, mouse liver tissue (~8 mg) and calf liver tissue (~17 mg) using the RNAstorm™ RNA Isolation Kit and a leading competitor kit. Concentrations were measured using Qubit. For all samples, higher yields were obtained using the RNAstorm™ kit. Electropherograms of total RNA from 106 Jurkat cells, extracted using the RNAstorm™ RNA Isolation Kit and a leading competitor kit. Post extraction samples were analyzed for quality using the Agilent Bioanalyzer RNA 6000 Nano assay. The RNAstorm™ kit delivered high quality total RNA with a RNA Integrity Number (RIN) of 10.